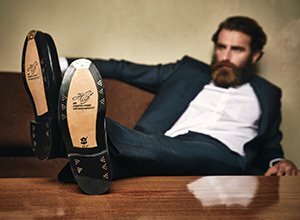 Our handcrafted, Goodyear-welted shoes start at £ 169. We bring our dreams of timeless, classic footwear to life in our own manufacturing facility—as a result, we are able to offer the extraordinary end products at sensational prices. From the very start, SHOEPASSION.com has embodied the concept of premium value. Ever since our award-winning online debut, we have offered only the highest-quality products. Our product presentation evinces our attention to detail, while our exemplary customer service stands out in the often-disappointing service sector landscape. Instead of selling hundreds or even thousands of footwear labels, we concentrate solely upon our own brand. We bring our designs to life in our Spanish factory. An exception: our lightweight summer shoes are handcrafted in Tuscany, in a facility also used by luxury labels. We sell our meticulously assembled masterpieces to other shoe lovers online and in our brick-and-mortar stores. Since we do not work with middlemen, we are able to offer premium quality at sensational prices. Cutting out middlemen allows us to maintain beneficial profit margins—consequently, we offer you good value for money. We also refrain from adding a weighty brand-name surcharge. The advantageous reach and comparatively low overhead inherent to e-commerce also allow us to offer our full-leather shoes at inexpensive prices. We do not operate at the expense of sustainability, though—we always make sure to use sustainable materials and produce our shoes in the EU.